Royal Oak in Bushey has been open a few months, following a takeover and a refurb. 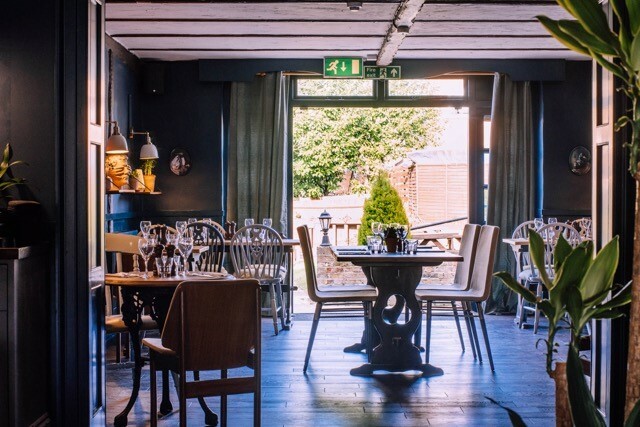 I love what they’ve done with the decor – all dark blue walls, warm wood tables and floor, cosy gastropub feel, intimate dining area, large convivial drinking/bar snacks area. Staff are friendly and bubbly – clearly happy in their jobs. All in all, a fab neighbourhood hangout. The menu is short – half a dozen choices per course – and changes monthly. The by-the-glass wine list is easy-pleasing (Sauvignon Blanc, Picpoul, Malbec, Merlot) and inexpensive (£5/£6 for large glass) with more interesting options by the bottle. We started with tandoori beetroot, innovatively paired with coriander yogurt and apple relish (£7.) Yum. And a house- cured salmon with pickled fennel (£7.50) – second time this week I’ve had fennel, which I don’t like, and enjoyed it! Must be a hormone thing. My main course was a fantastic duck dish – duck breast and crispy duck leg with root vegetables and caramelised plums (£16.50). Huge. I couldn’t finish it. S had rib eye steak (because he always does – £21) which came with beef fat potatoes and a STUNNING portion of beef short rib, which had been slow cooked for 14 hours. On the side – really good home-made onion rings in batter not breadcrumbs, and tempura tenderstem broccoli with ogleshield (no, me neither – apparently it’s a cheese). This last dish is so so good. And is £4 for a huge portion. We’d eagerly eyed the dessert menu when we first sat down so we didn’t even ask for it back – there was no question of veering off our choices. Chocolate delice for S (£7) sticky toffee pudding for me. The delice was a rich, intense, firm, melt in the mouth dark chocolate mousse with salted caramel and Bailey’s; the STP was an individual mini loaf with sauce, caramelised banana and ice cream. I’d have liked a little (actually a lot, because I’m greedy) more sauce and next time I will ask for that. We chatted to exec chef Wayne who is incredibly well-travelled in pursuit of inspiration for his dishes and the presentation of them – and it shows. The Christmas party menu is amazing value at £29.95 for three courses and there is 15% off if you book by the end of November. There are a couple of tables left for Christmas Day. And there’s 15% off food Tuesday & Wednesday evenings and Thursday lunchtimes with The Restaurant Club Card.